View the creation of cosplay props in progress and learn some interesting techniques to help with your own. This particular project is for a good friend of mine. He is my height, so I began the project by realizing something right off the bat - the character holding these swords is very, very tall. So using a sword I have in my home (a real one!) I decided to work between the measurement of that sword (36" from pommel to tip) and what I thought the real swords were (I think about six feet long, yeeesh!) and ended up 46 inches. It seemed to be perfect as far as my height went. 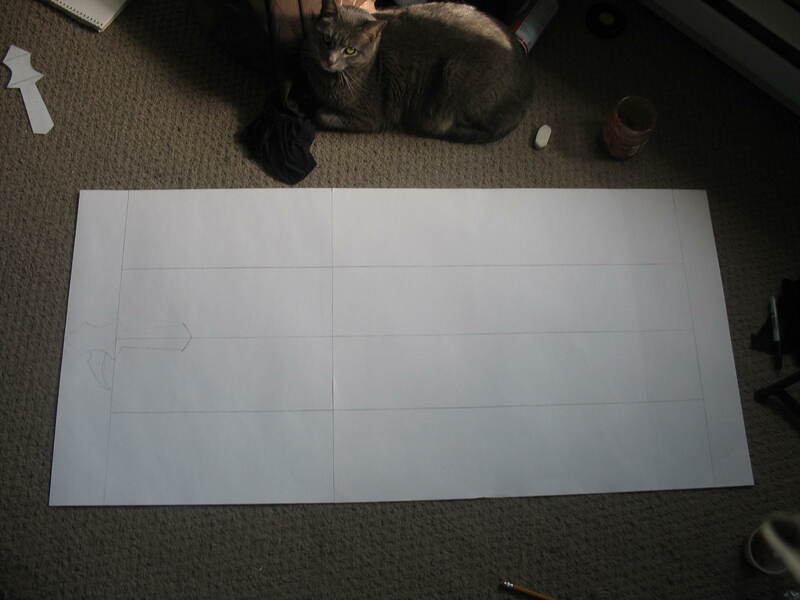 As my cat Xem watched on, I began with a template of the sword's pommel I sketched up and cut out (which you can see in the upper left corner). 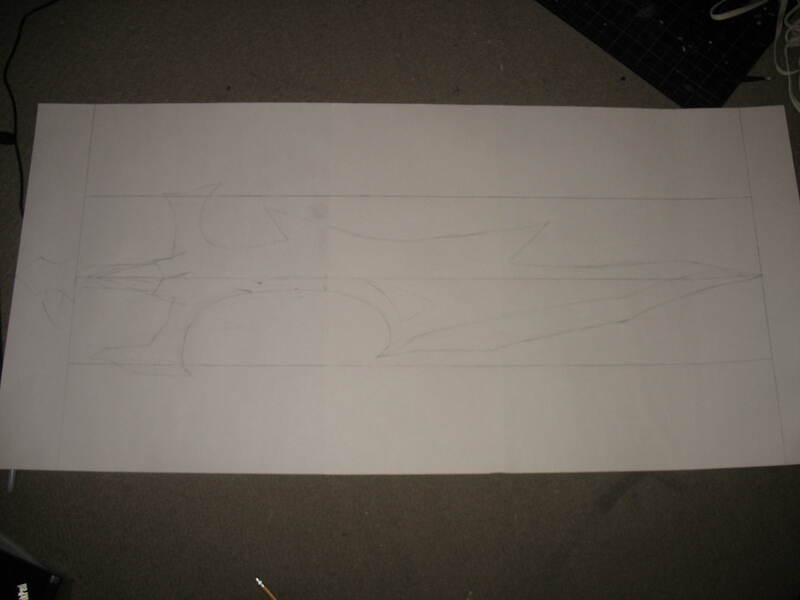 I figured out about how wide I thought the swords were (I guessed 10 inches), which are insanely wide in the area of the guard and have more of an 'axe-blade' type of blade, and began sketching from there. These are the variations on the sketches I started, until we settled on the last one. 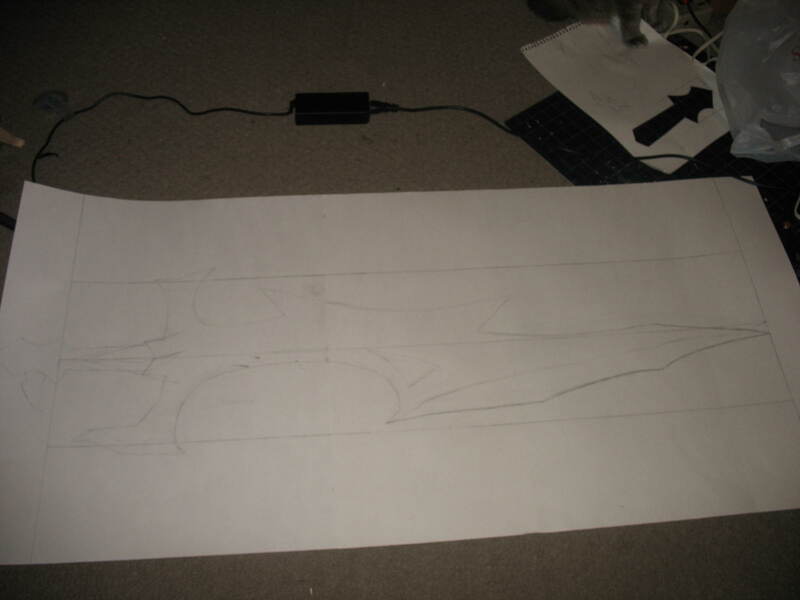 I also realized the swords needed to be wider than 10 inches, hence why it goes outside of the sketch-assigned area. 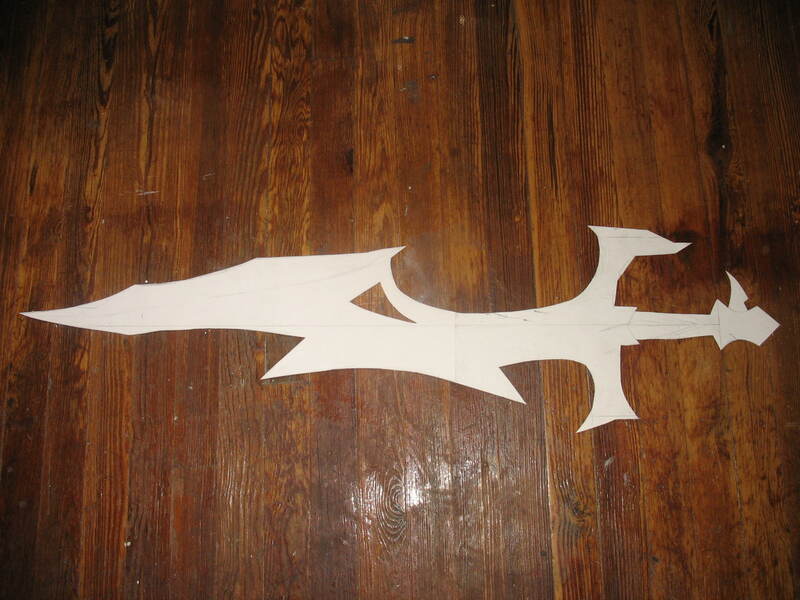 This was the blade cut out (and upside down in this picture, excuse me for that. And tada! 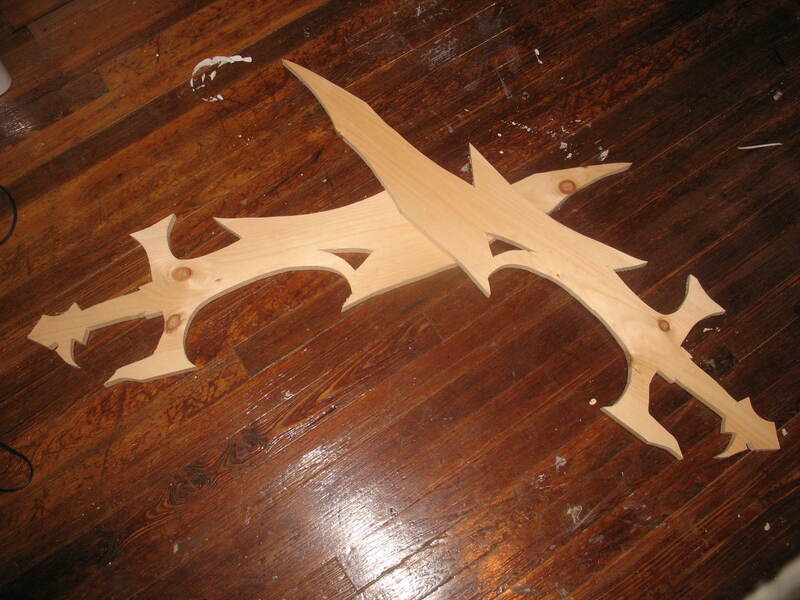 The swords cut out via three methods: bandsaw (general shape), jigsaw (the curved shapes, which bandsaws don't do well), and scrollsaw (the holes in the center). Next up will be the beginning of sanding. 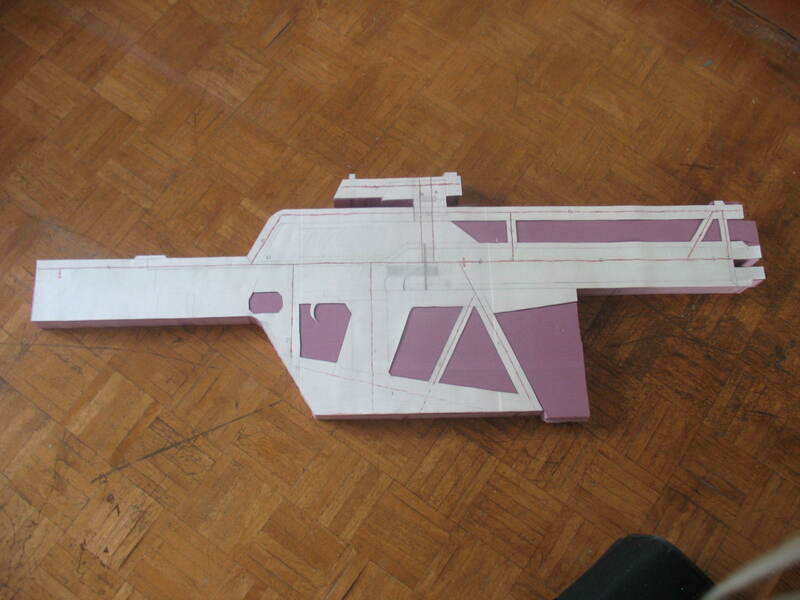 Those of you who know me know how I love big props, so when a client asked me to take on a several foot long railgun... I was all ready for it! First, one of my friends, upon hearing that I would be doing this from Metal Gear Solid 2, was awesome enough to loan me a PS2 CD that has all the character sketches and 3D models on it. How I needed this, as the reference pictures I could find were generally terrible! 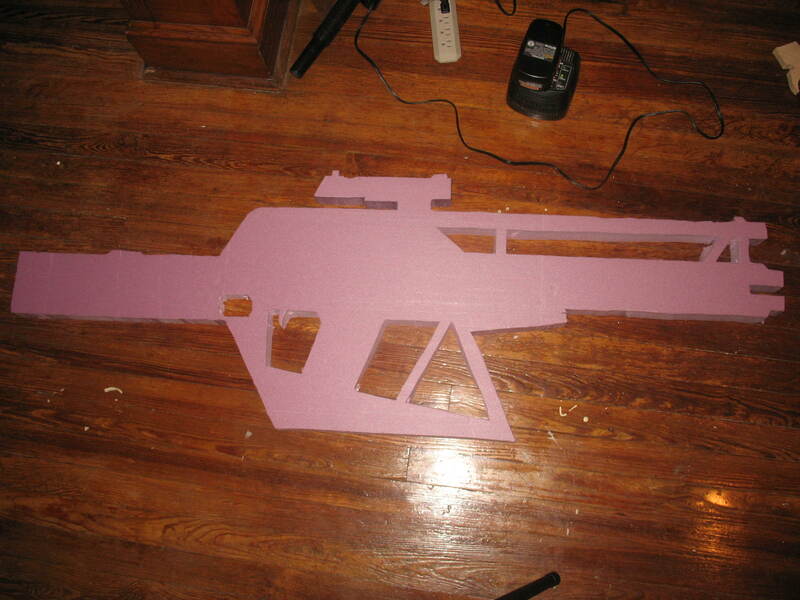 So sitting for several hours in front of my TV, I built this full sized paper replica of the gun. Here was the gun mostly cut out of foam. The scope is not going to be out of foam - it will be metal and PVC pipe, but it is currently remaining there so I can sketch things out to proportions. Speaking of proportions, the proportions of the gun are slightly off. The actual gun is easily six feet long, but for the size of my client it had to be reduced in places to make it work. I believe it will be next to unnoticeable in the final product. Now one thing you might notice are the red lines on the paper gun. 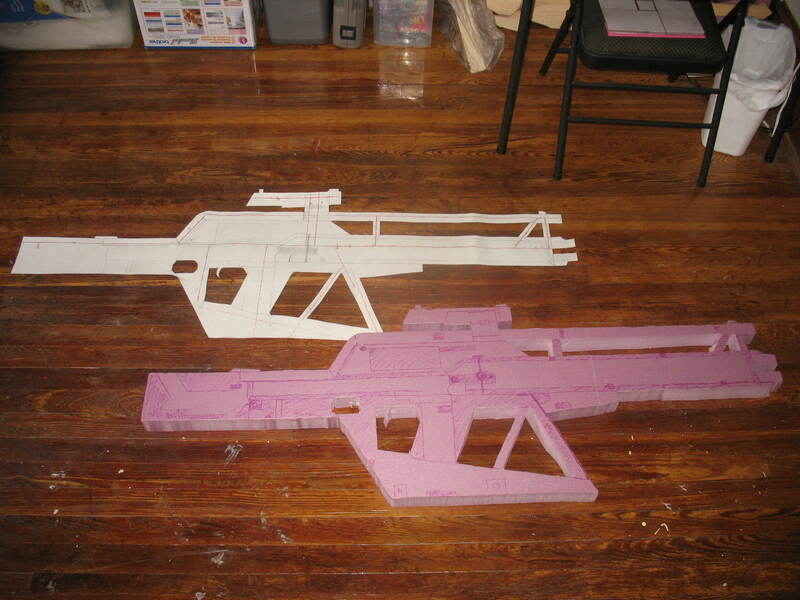 Originally I thought I was going to include a wooden skeleton for stability on the inside of the foam, but realized that this solution would not work and instead resin would be used to strength the gun. Here is the gun completely cut out. A drill and my jigsaw finished what the bandsaw was unable to. 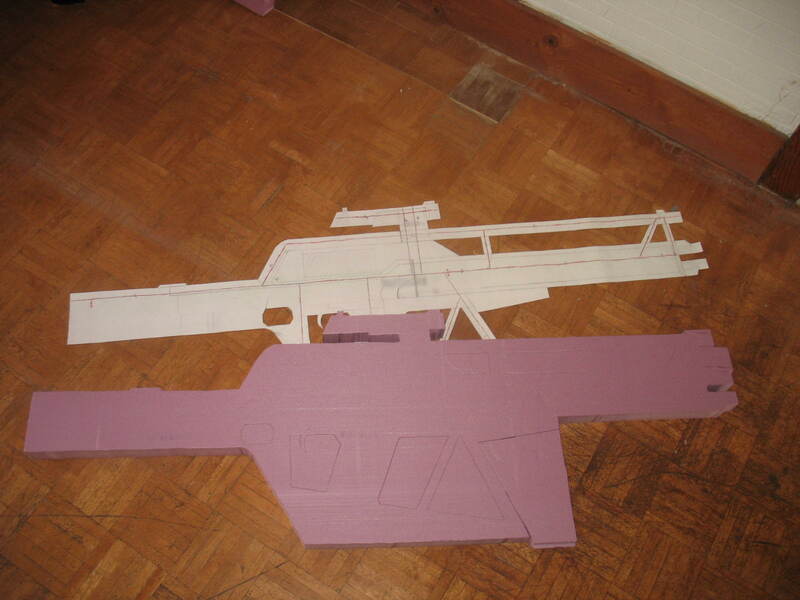 Here the gun has been sketched onto the foam. The wiggly lines indicate where the gun needs to be carved into while the clean areas are the most up-raised parts. I am really excited about this project. Next up is carving all of those details into the gun. I started this project off much like I had Tobi's mask - with Crayola Model Magic. Unfortunately, I rapidly discovered two things about this mask. One is that this was going to need to be much thinner than I first expected, and second was that the eyes of the mask, in a screen shot of the anime, are further apart than actual human eyes. I needed to remedy both of these problems. 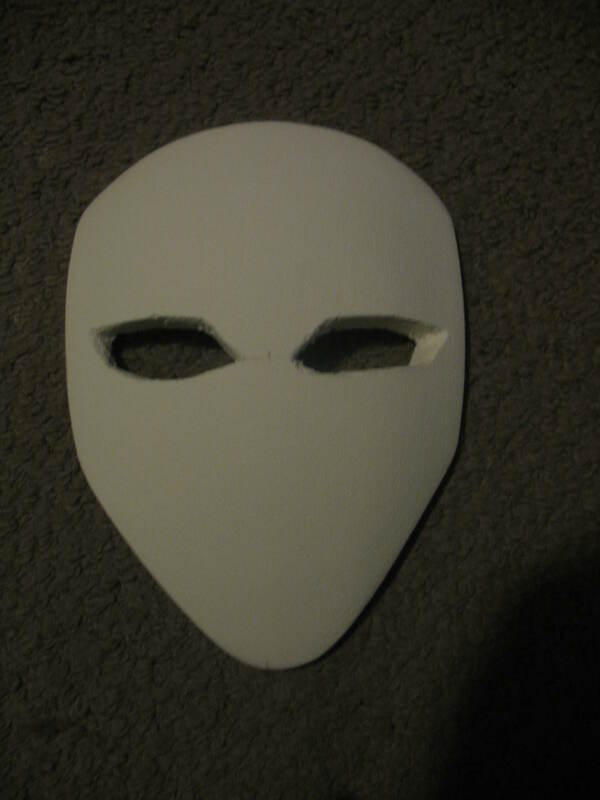 So my first step was to work out a new design for the mask. 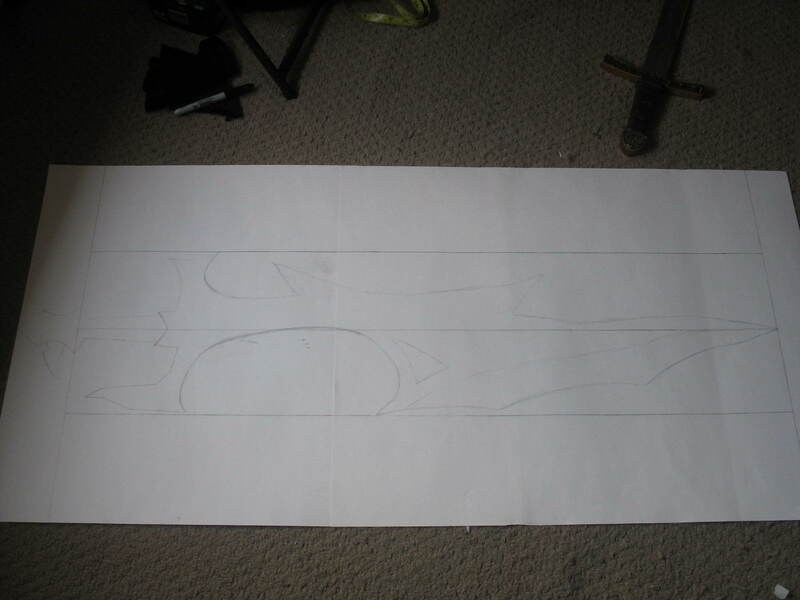 I began by making a basic shape on paper of what I thought the mask looked like. 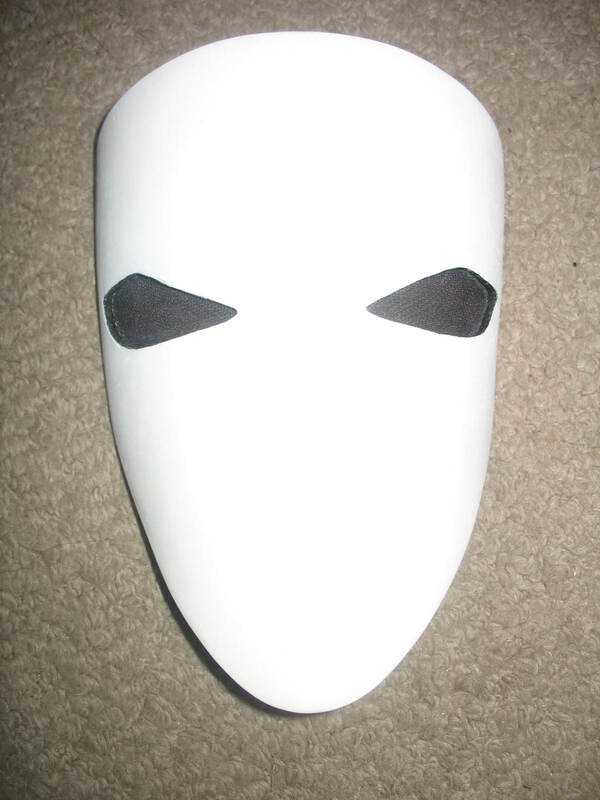 In some images of the mask, the chin is more rounded and in others, it is quite pointy. The rounded but slightly pointy chin was a mix of the two. I also discovered a new material to work with at this point while searching for a material that would be a cheaper substitute than wonderflex. It is called Sintra, which is used in sign making, and is heat moldable. Unlike wonderflex, it is smooth on both sides, comes in many different thicknesses, but does not stick to itself. It is also quite cheap (a 4'x8' sheet was 40 dollars from a local place) so I was pleased to give it a shot. Here you can see three variants on the mask in one shot. 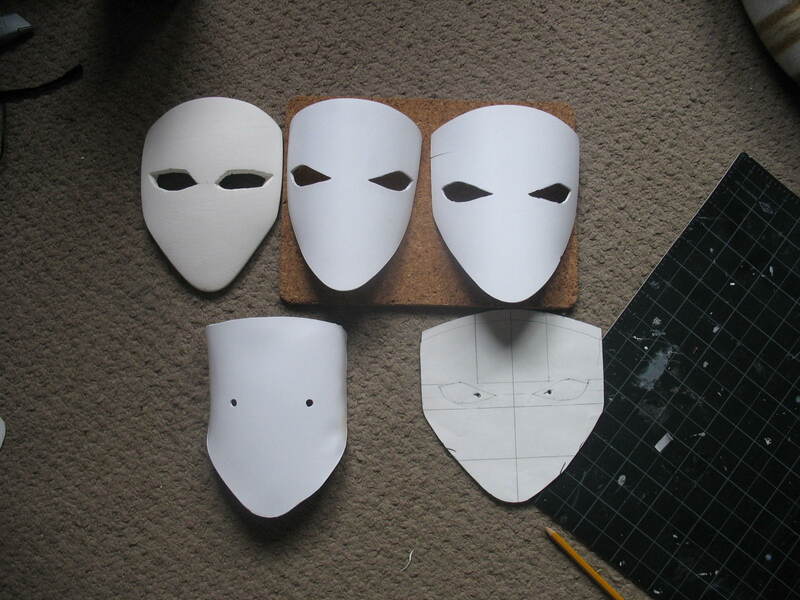 The farthest right is the paper mask I worked out with eyeholes. The one on the far left is the previous attempt with model magic, and the one in the middle is my first experiment with the Sintra. I discovered that using a heat gun, as I did with wonderflex in the past, worked but it could 1) burn the Sintra leaving scorch marks and 2) did not heat it evenly enough to get a smooth flow. 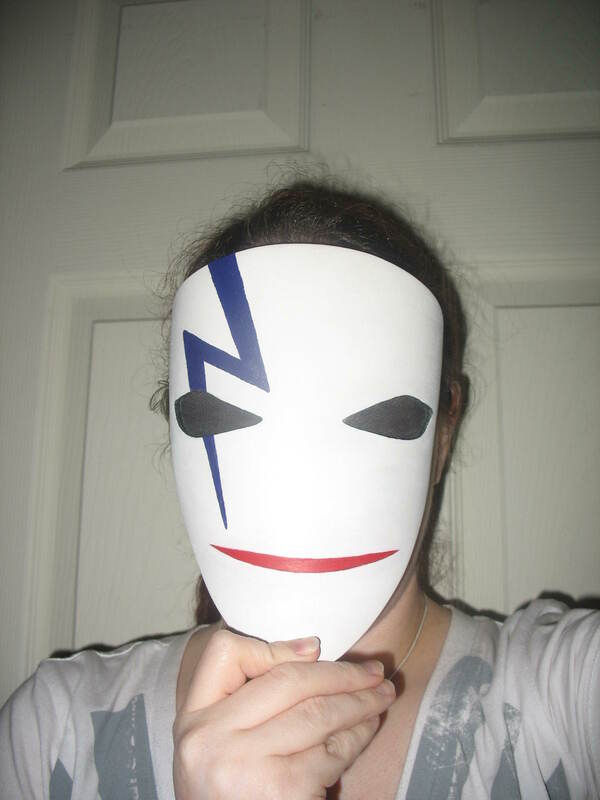 This was my first real attempt of the mask. I discovered that by putting the Sintra in the oven at 200 degrees, it turned as flexible as paper. I only had to gently hold it in the position I want for about a minute in my hands, and it stayed perfectly in that shape. 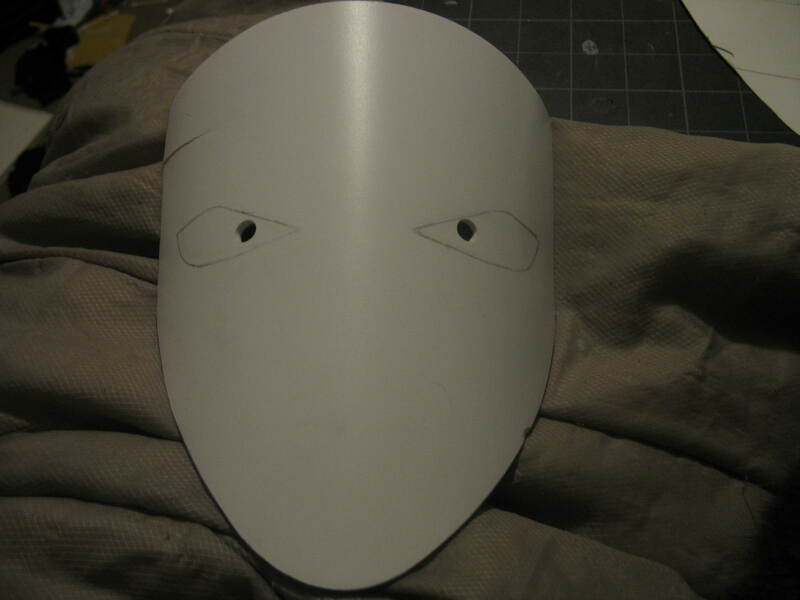 I also quickly drilled the eyeholes so I could start to see what I was doing. It was about this point, as I sketched on the eyes, that I realized I needed the mask to be flat to cut out the eyeholes instead of curved. 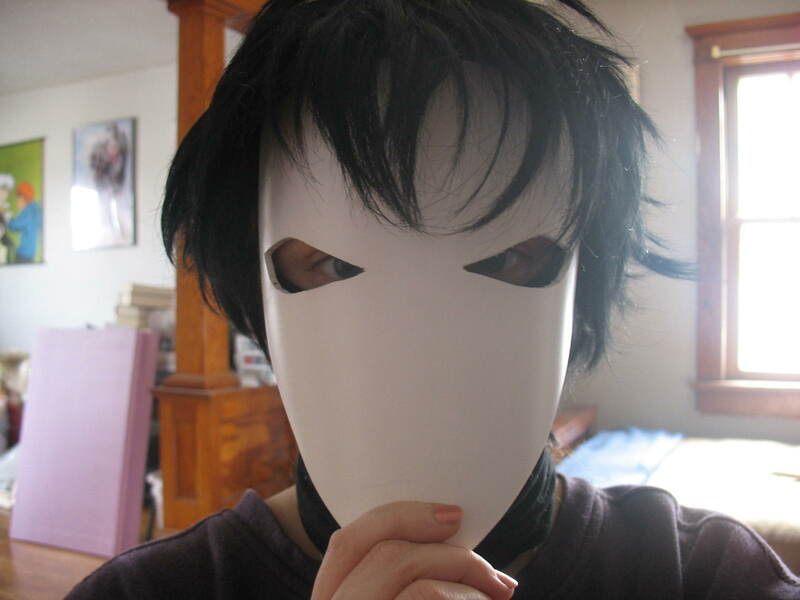 I also realized the mask was too long and would not fit properly under a wig. So I made a second mask and this first mask became a 'test mask' so to speak. Here is another set of multiple stages. 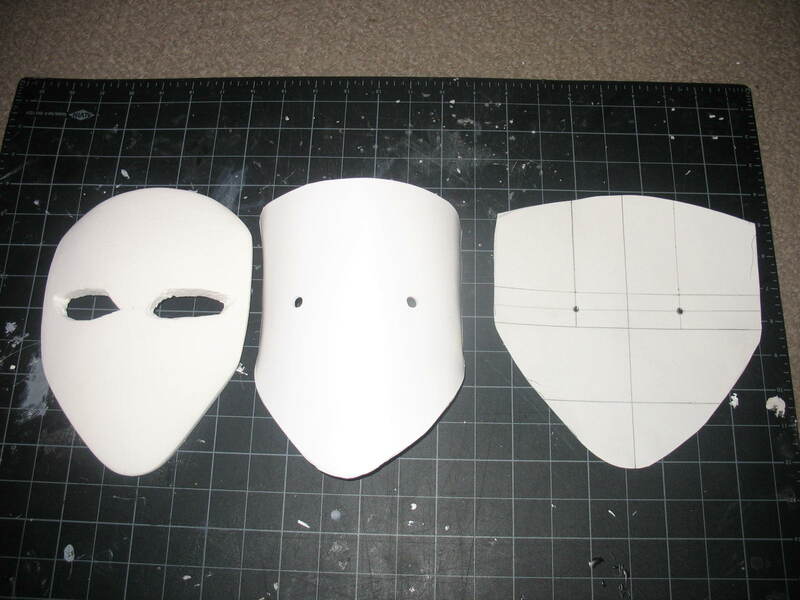 The top-far-right is the test mask, and the center-top was the newly cut and curved mask. You can see from this incredibly silly picture how I look through the corner of the eyes more than the center - this gives the appearance of the eyes being further apart than they really are. For any question of it - I could see perfectly through the holes with only a very faint mark directly in the center that didn't bother me at all. 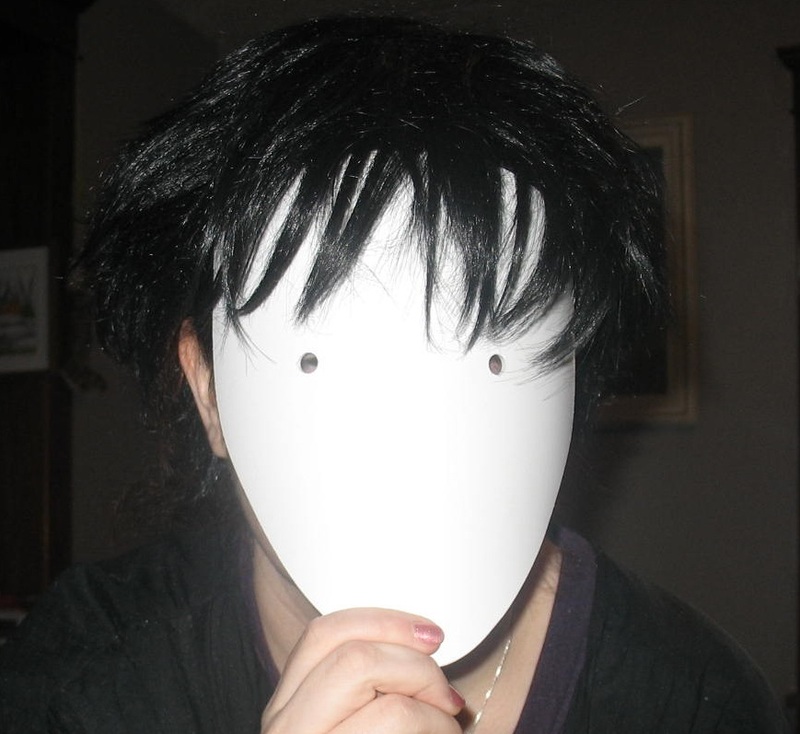 It also shows how the mask fits easily enough under a wig to give the right illusion it requires. The eye holes were 'hidden' in the screen shots, so I improvised. From a left over pair of pantyhose from my Deadmau5 head, I used a sharpie to color them black and hot glued pieces of it stretched over the eyeholes. The pantyhose all but melted into the hot glue, which I quickly realized was a requirement to keep the hose from running. The illusion worked very well in a quick test with a camera and flash. I could see well enough through the eyeholes to not be concerned and they could not see my eyes. 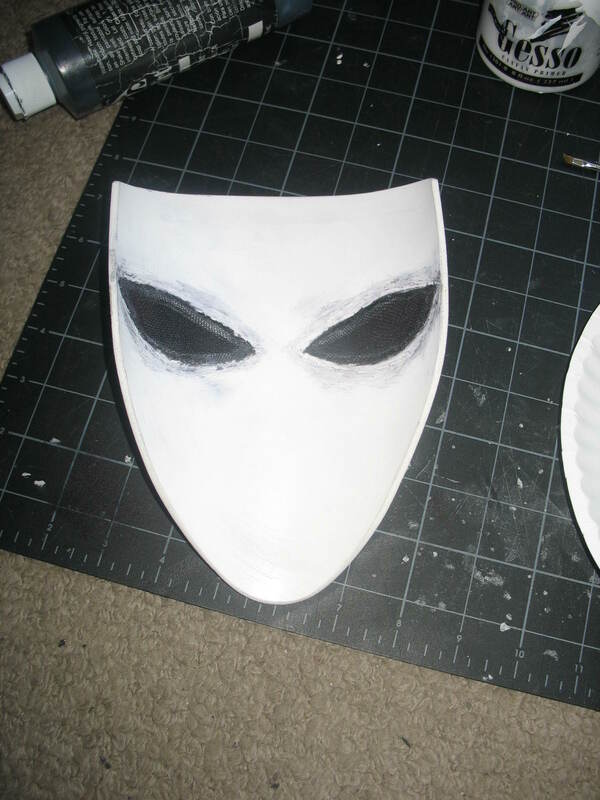 I used black paint around the edges of the eyes to help further the illusion of the hidden eyes, and covered the mask in white gesso. The Sintra is easily damaged by nearly anything, and this hid any marks from sanding. It looks perfect in pictures, so I was pleased. 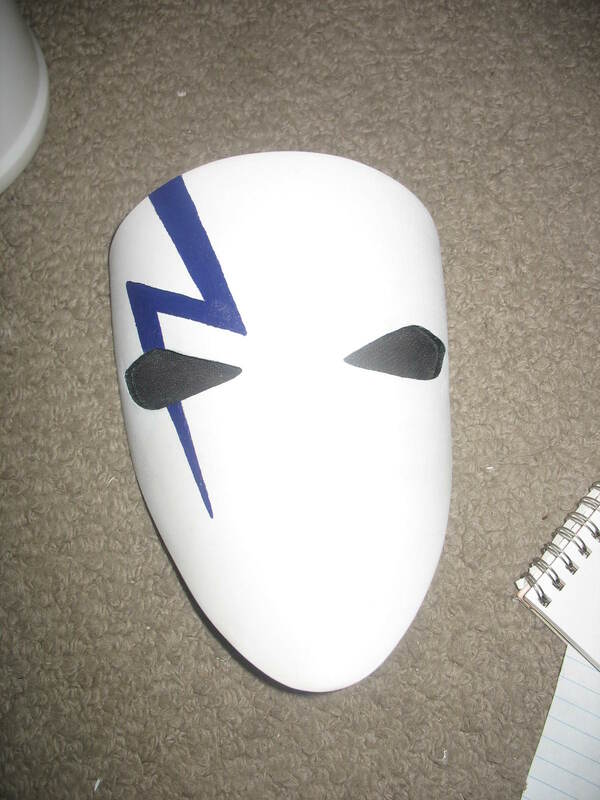 I cut templates for the lightning bolt over the eye as well as the mouth. Again, some compromise had to be made with the mouth. In some images it is 'smiling' and in some it is 'flat'. We went with this. The over all mask highly pleases me. 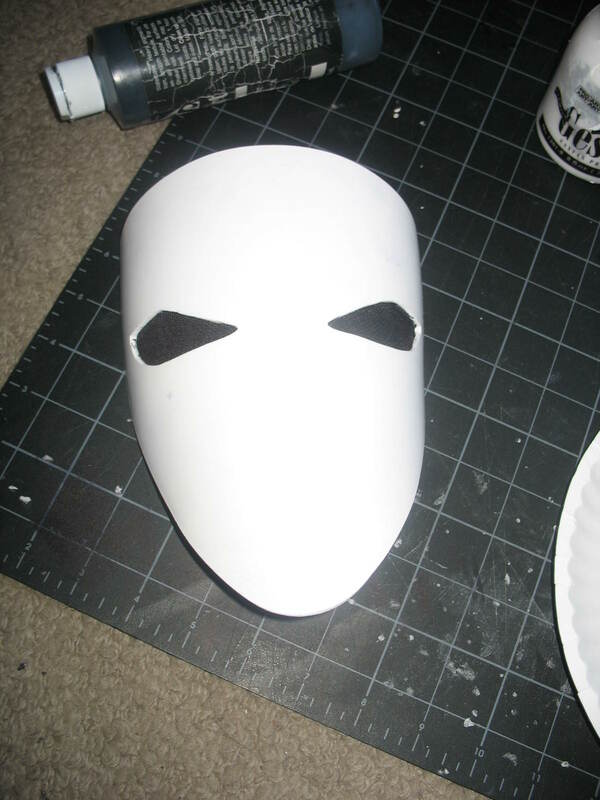 The simple solution of the eyeholes turned out to be a very positive one, and the material choice has led me to believe I will be making all further masks with Sintra. I still have mounds of it left over, eep! Commission Status: OPEN! My name is Jantra, and I'm a website designer by day and a prop builder by night. Feel free to contact me at silverwingcreations@gmail.com with questions or commissions.